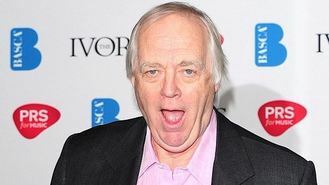 Sir Tim Rice, who has been behind musical stage hits such as Evita and Jesus Christ Superstar, is to be honoured for his contribution to music at a respected music industry awards bash. The writer and lyricist follows figures such as Bryan Ferry, Ray Davies and last year's recipient John Lydon in being awarded the "Icon" award by US music rights body Broadcast Music Inc (BMI). The award is presented to to songwriters who have had "a unique and indelible influence on generations of music makers" and Sir Tim will collect the honour at a gala dinner on October 13 at London's Dorchester Hotel in Park Lane. He worked with Andrew Lloyd Webber on a number of musicals, as well as Abba songwriters Bjorn Ulvaeus and Benny Andersson on Chess and Sir Elton John on The Lion King. Sir Tim, who has shared in three best song Oscars, said: "I owe it all to Tommy Steele, Lonnie Donegan, Billy Fury, Marty Wilde, Cliff Richard and Joe Brown." BMI president and CEO Michael O'Neill said: "Sir Tim Rice's extraordinary creativity has given the world some of the most beloved songs of the past 50 years, sheer musical poetry that has thrilled audiences in films, musical theatre and on chart-topping recordings." Rudimental are to reach new heights with their music - by performing on a Boeing 787 above the Atlantic Ocean. Calvin Harris looks lined up to score his fifth UK number one this weekend. Susan Boyle is preparing for the wrath of rock fans by tackling classic tunes by the likes of Pink Floyd and John Lennon for her new album. Kanye West has found himself in hot water after refusing to carry on with a show until everyone was on their feet - only to discover one fan was in a wheelchair. Taylor Swift showed she has a sense of humour when she praised a group of frat boys who parodied her video. Amy Winehouse has been immortalised with a life-size statue. An emotional Beyonce was in tears as she and husband Jay Z wrapped up their On the Run stadium tour in Paris, where the duo said they got engaged years ago. Mercury Prize winners Elbow have backed singer songwriter Nick Mulvey to take this year's award as they performed at the 2014 iTunes festival.